This class introduces students to the fundamentals of improvisation. Through exercises and games, students will learn the basic skills of improv and have fun developing their spontaneity, playfulness, imagination, and confidence. 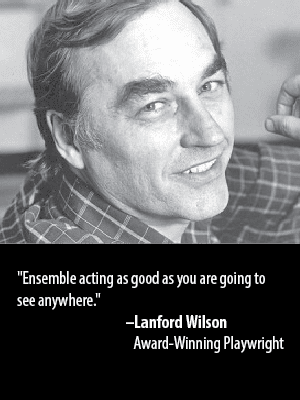 Improv is an essential skill for any actor, and it’s a useful one for life, as well. No experience necessary. This class introduces students to the basic principles and most popular structures of long-form improvisation, including The Montage, Time Dash, Monoscene, and The Harold. In addition to developing storytelling skills through these long-form structures, students will learn more advanced techniques for improv scene-work, expand their character range, and increase their confidence and playfulness as performers. Pre-requisite: Improv I or similar experience. Our drop in classes are for students who have taken Improv I or similar experience and want to continue playing and learning new skills. It’s a great tune up session and opportunity to meet other improv students. The Barrow Group offers a wide variety of improv activities, for the beginner to the professional. Our Level 1 class is designed for those new at improv, and the skills taught are those necessary to be successful in this mode of expression. Being comfortable onstage, knowing yourself as a performer, thinking on your feet – this are all things that will be addressed in our Basic Improv class. You’ll learn to play a variety of improv games, similar to the popular show “Whose Line is it Anyway?”. Improv will stimulate your imagination and ability to act on cue. Working with your classmates, you’ll develop rapports and be able to trust them to help you out of a bind if needed. Our improv activities train you to be an innovative and refreshing actor. Our second improv class focuses on scene work and long form improv. Long form is a style of improvisation that bases its entertainment on very few and possibly a single ask for from the audience. Because it involves the audience less, long form relies more heavily on acting skills and ensemble memory, that can entertain for an entire 45 minute set. Some examples of the long form are The Montage, Time Dash, Monoscene, and The Harold. The Harold is simply a series of scenes that are connected by a common theme. For instance, ‘rag’ could be a set up for the theme ‘cleaning’. The scenes in a Harold are almost all open scenes. When a series of open scenes are being played it important that all the players understand how to signal a scene change. This can be done by dimming, but no blacking out the lights. When the lights dim it is a signal that a scene has ended, and players should be up to start a new scene immediately. Players that are coming on to start a new scene enter down-stage to the players that are doing the scene. Players that are joining the scene arrive from upstage the players doing the scene. In ending a Harold, hopefully the scenes will organically start to flow together with recurring characters, such that one story is dominating all the scenes and new scenes are in support of the singular story. For the actor who wishes to hone her or his skills, the drop in improv activities are a perfect way to brush up on the techniques taught by The Barrow Group. Students find familiarity, as they are working with the same excellent instructor, and can jump in and play with actors who are new to them, creating unique challenges. Ultimately, this refresher class can help the improv actor renew the brilliance of her or his talent. If you’re a business owner, supervisor, or team leader, you may be looking for ways to bring your employees closer together. Different team building exercises can make a team more productive by making each member more comfortable with the others. These exercises also build trust and help each employee better understand what they bring to the table. Improv activities can actually be a great team bonding exercise. Improv scenes help break down the barriers between team members, make everyone feel more at ease, and get the creative juices flowing. At the end of the day, your group will feel closer to each other and will have learned to think more creatively.